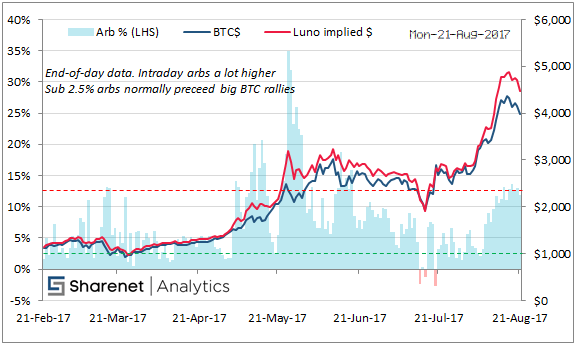 Many people often ask why the LUNO price we provide for Bitcoin in ZAR on our crypto page, our spots on our mobile app and our spots page does not translate to the $ price when converted using the prevailing R/$ exchange rate. This high arbitrage phenomenon is prevalent in many emerging economies with limited choice of� high-liquidity Bitcoin exchanges, stricter exchange controls or where access to international bank accounts is limited. Since the local supply is restricted, the arbitrage is much more sensitive to or reflective of investor euphoria which makes arbitrage a great measure of sentiment. This can provide for some great arbitrage trading opportunities, where one has dollars on an exchange offshore and Bitcoin on LUNO, one can buy the cheap Bitcoin in dollars offshore and sell them on Luno for a higher price and guaranteed profit. We normally pencil in at least 5% "friction" on the trade to cover slippage, transaction costs etc, which means arbitration needs to be at least above 10% to make it worthwhile. But we find this arbitrage much more useful in reflecting local sentiment. The higher the arbitrage, the higher the local South African bullish sentiment or "animal spirits". Conversely, the lower the arbitrage, the higher the bearish sentiment. If you look at the above chart you can see that instances where the arbitrage was lower than 2.5% (green dotted line showing very bearish sentiment) almost always preceded large rallies in Bitcoin. 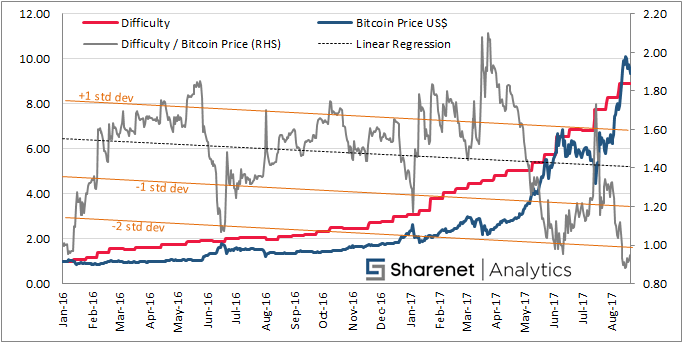 Similarly, when the arbitrage expanded to above 12.5% (red dotted line showing very bullish sentiment) the price of Bitcoin normally corrected shortly after. 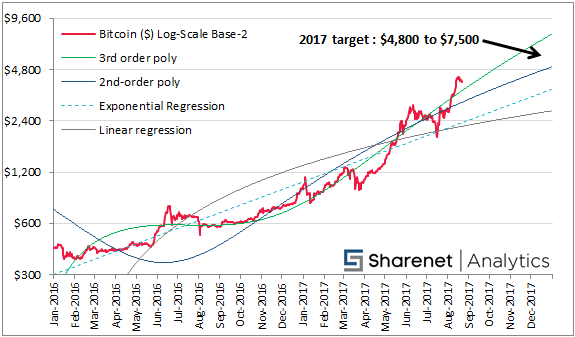 The above of course assumes continued mass adoption of Bitcoin toward the end of the year and no hard fork complications or jumping ship to Bitcoin Cash. Also, the forecast lines are by no means indicative of how smoothly we will get to indicated objectives.